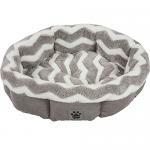 Thanks for looking at our Precision Pet SnooZZy Hip as a Zig Zag Shearling Round Bed! Your pet will love curling up in his or her Snoozzy Hip as a Zig Zag Shearling Round Pet Bed. The soft, circular design of this SnooZZy pet bed will foster a sense of comfort and security, especially for breeds that tend to burrow. Rich, buttery velour in chevron prints covers the entire snooze surface. Woven cording and linen-textured fabric span the outside. Your pet"s neck and back will be well supported by the generously stuffed bolster ring. The stuffing consists of polyester fibers derived from recycled plastic bottles! Machine washable. About Precision Pet Products Precision Pet Products is an established and respected manufacturer supplying a wide variety of pet products to all facets of the pet industry since 1985. Located in Orange County, California, the Precision Pet Products team assures that their products are constructed from the strongest materials available and designed to withstand the wear and tear of the most active of pets and pet handlers.